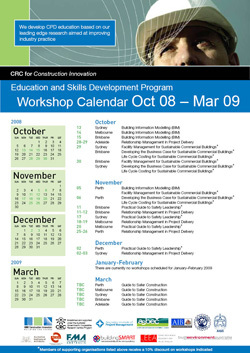 The updated calendar of Construction Innovation workshops has just been released listing the industry supported workshops running from October 2008 through to March 2009. The program begins in mid October with a free Building Information Modelling (BIM) workshop followed by workshops addressing sustainable buildings, safety, and relationship management. Workshops are being held in Brisbane, Sydney, Melbourne, Adelaide and Perth. Most workshops run for either half a day or one full day, with the exception of Relationship Management in Project Delivery which is a two-day masterclass run in partnership with Engineering Education Australia (EEA). The Masterclass in Relationship Management for Project Delivery is an industry-relevant workshop which focuses on breaking down traditional ‘adversarial’ environments that many projects endure, introducing fresh knowledge and skills that will guide the implementation of strong collaborative relationship management approaches. An interactive case study is used throughout the course to assist learning. Workshops are run by experienced facilitators and industry professionals and are suitable for a wide target audience. Visit the online education calendar to read the course outlines and to find out when these workshops will be visiting your city. For further information, including options for in-house delivery please contact Construction Innovation’s Education and Training Officer Lyn Pearson.